The dream holiday for Crossfitters! Ever dream of vacationing with 3,000+ people that love CrossFit as much as you do? Welcome to WOD on The Waves, a once in a lifetime chance for you to train and party with the fittest (and your favourite) athletes in the world. All on a cruise ship! WHAT IS WOD ON THE WAVES? The ultimate fitness cruise. A full-ship charter created specifically for the CrossFit community with fitness, nutrition and programming all specifically tailored to US. So what exactly will you get to do on this fitness filled adventure? Here are 10 great reasons why you should book now! And there are more to be announced as well! Oh and Neptune, the God of the Sea, is also down on the roster as well. There will also be a team of expert trainers to assist and coach you. Ever wanted to train with top athletes in the sport? Then sign up and make those wishes a reality! It doesn’t matter how fit you are, or how long you have been training, everyone is welcome. Finish your days with some post WOD entertainment with the star-studded crew of Crossfitters. Have a specific skill that you want to work on? Or just keep your training varied, then try these courses during your trip. Barbell Technique: Lightweight, position work – drill the positions that will allow you to maximize your lifts! Dumbbell Class: Just imagine anything you can do with a barbell, we will do that with dumbbells. Deadlifting, snatching to lunging – be ready for some challenges! Sandbag Sesh: Learn how to lift odd objects, carry them and move some heavy weight with some new tools! With an entire crew of incredible athletes to coach and train with you, you will feel inspired and rejuvenated every day! It is not hard to see why any Crossfitter would love this vacation! Why not spoil your significant other and surprise them with a ticket for WOD on The Waves? Even if you aren’t a Crossfitter yourself, or are travelling with someone that is, then there will still be plenty to do. Or alternatively – treat yourself. If you are traveling solo then its easy to make new friends – and save money – with the Independent Traveler Program (ITP)! WOD on The Waves will match you up with a fellow cruiser and knock your room fee in half! This offer is available for interior, ocean view and ocean view balcony rooms. Need to keep things constantly varied? Why not try climbing, swimming, the casino, mini golf, the arcade, the spa, surf on the flowrider or star gaze at the observatory? Whatever you like to do, then WOD on The Waves will have you covered! 2. STAY ON A BRAND NEW LUXURY SHIP! The WOD on the Waves team chose the best ship to vacation on – Royal Caribbean’s Mariner of the Seas! Why is it so great you ask? Well, let’s start with the fact that ship just completed a $120 million amplification in June 2018 (aka the ship is BRAND NEW!). Choose from multiple restaurants serving delectable dining, to an exciting nightlife scene with a solid lineup of bars and lounges. Take advantage of the warm weather and arrive to the Miami area a day or two before the cruise (January 19 or 20) so you can experience all that Miami has to offer. This will help you avoid missing the ship’s departure due to flight delays, cancellations or weather issues. Better safe than sorry! Wodapalooza is also taking place right before the cruise departs, so its the perfect chance to attend both! 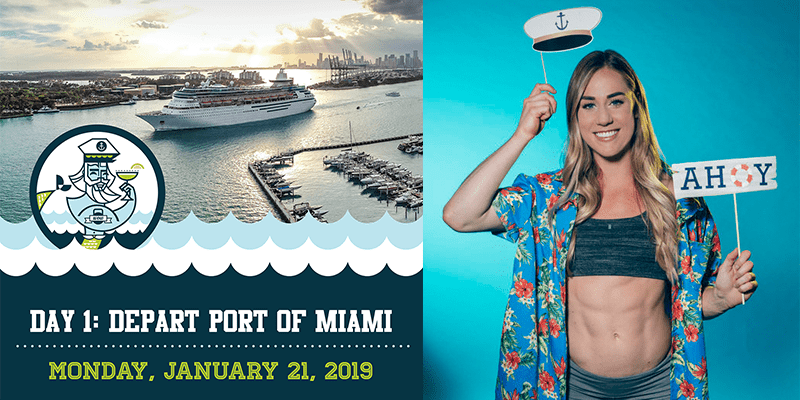 The world’s ultimate fitness cruise sets sail Jan 21 – 25 2019. Make sure you are on that boat!